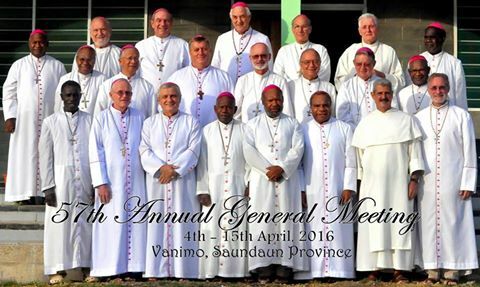 22 Catholic Bishops of Papua New Guinea and Solomon Islands have gathered here at St.Anthony’s Pilgrim House, Vanimo for their Annual General Meeting (AGM) 4-15 April 2016. They discuss spiritual, social and moral issues affecting the people of both the countries. The main theme of the meeting is “Sharing the Good News of Mercy”. The bishops have come up a pastoral letter on this topic. They have also discussed about lack of consultation and dialogue regarding Education policies in PNG. Tuition Fee Free education is not well carried out. Catholic Health Services are the backbone of the people mainly in the rural areas and they account to 30% of the health services in the country. But the Government has decided to cut K51 million from the budget supposed to be given to the churches. It will affect the staffing, salaries, supply of medicines, health services, etc. The Bishops have come up with a statement on Education and Health. They also discussed about the elections of 2017. They have come up with a pastoral letter on “ Christian Faith and Elections”. The Bishops took this opportunity to go to Jayapura in Indonesia. The 22 bishops had a meeting with 4 of the 5 bishops of West Papua. They discussed issues of cooperation between the dioceses of West Papua and the dioceses of PNG/SI. The issue of the refugees and the cry of Independence of the people of West Papua were also discussed. The bishops will come up with a statement at the end of the meeting. The people of Vanimo will give a big farewell to all the bishops during a ceremony in Don Bosco Higher Secondary School on Thursday.